Week 5 might have been a bit of a struggle, since we were really trying to keep busy, which meant everyone kept falling asleep early. The kids finally finished their books between yesterday and today and I still have a bit to go on mine, but hopefully I can stay up a bit later and get it done. Even so, I'm going with a shorter choice this week, since we've got two day camps (morning and afternoon), along with two nights of swim team. If no one else ends up tired, I certainly will be! Me: The Colossus Rises - Shaun picked this for me at Sam's a few weeks back. 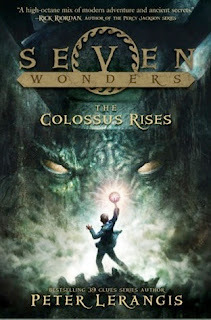 It reminds me, in a way, of the Percy Jackson books, and I love anything to do with the Ancient Seven Wonders. 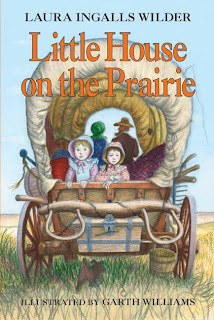 Faith: Little House on the Prairie - Faith is continuing with the Little House series this week. I so enjoy being right, even though Little Miss Stubborn doesn't agree. I knew she'd like the books if she'd just give them a fair shake. 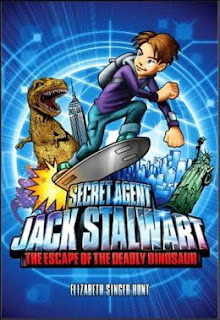 Ben: Jack Stalwart - Secret Agent - The Escape of the Deadly Dinosaur - Ben found this series at our $4 Book Store and got the first three, he says it is quite awesome so far!